Ellyn's Tap & Grill features great food and drink in a casual environment. We have something to please every appetite, from our BLT Chopped Salad to our famous Italian Beef Eggrolls. Our huge 8oz. burgers are always fresh, and come in many classic styles. Free wireless internet and a casual environment makes for the perfect work-lunch environment. We have 15 HD TV's so you can catch all your favorite games here with a cold brew or a cocktail, and our kitchen is always open late! If you’re looking for a dining spot that offers great food and service at a reasonable price, then you’ve come to the right place. 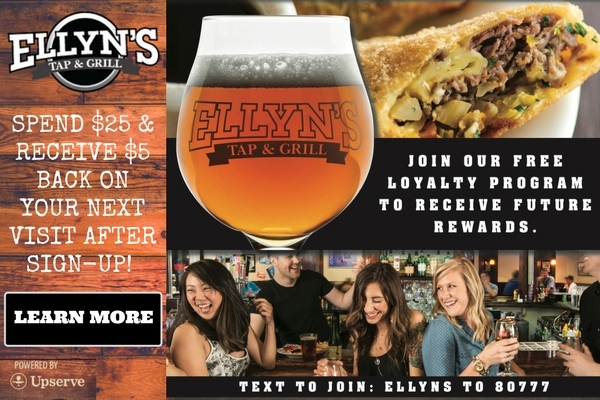 Ellyn’s Tap & Grill is sure to be a favorite amongst locals, for a business lunch, an after work get-together, a hearty dinner or a late night snack. We offer some of the best craft beers in the area. Check out our menu for draft and bottle selections. We also offer fine wines, spirits, whiskey, bourbon, and scotch. Don’t forget our daily specials where there’s a little something for everyone. Crispy chicken tossed in buffalo sauce, with ranch & blue cheese. For those who enjoy a little kick.